TC Mag writes SilverStone will start shipping the GD03 HTPC case next month, this model will be available for around 190EUR. 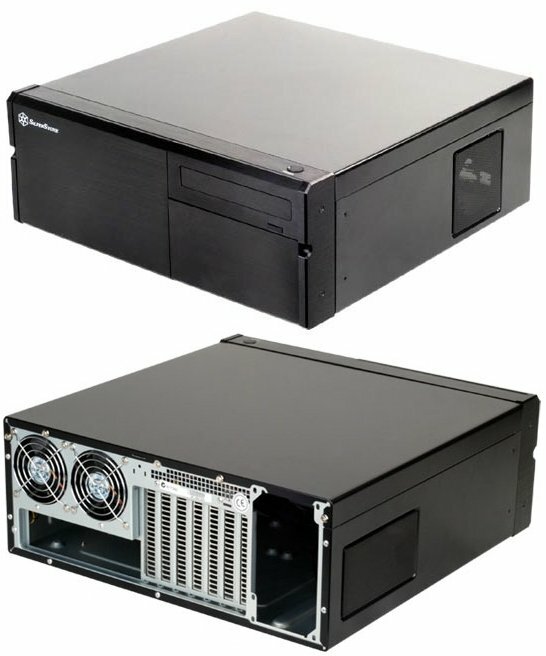 Seen below, the black chassis measures 425 (W) x 182.2 (H) x 436 (D) mm, weights 7.85 kg and has a front I/O panel with two audio, one FireWire, and two USB ports, two 5.25-inch bays and two hot swappable SATA hard drive racks. Also providing five internal 3.5-inch bays (for even more storage), the case comes equipped with two 80mm fans at the back running at 2050 RPM and featuring a sound output of 21 dBA.